A child and her parent present to the clinic to discuss anxiety symptoms that the child has had for over a year. The therapist talks with the parent and child about the possibility of starting a selective serotonin reuptake inhibitor (SSRI). A systematic review comparing SSRIs with placebo has shown that SSRIs reduce anxiety symptoms by a standardized mean difference (SMD) of −0.65 (95% confidence interval −1.10 to −0.21).12 The therapist finds these results difficult to interpret and not easy to explain to the parent and child. Outcomes of importance to patients such as quality of life and severity of anxiety or depression are often measured using different scales. These scales can have different signaling questions, units, or direction. For example, when comparing the effect of two cancer treatments on quality of life, trials can present their results using the short form health survey 36, the short form health survey 12, the European quality of life five dimensions, or others. Trials may also present their results as binary outcomes (proportion of patients who had improved quality of life in each trial arm). Decision makers need to know the best estimate of the impact of interventions on quality of life. The best estimate for decision makers is usually the pooled estimate (that is, from a meta-analysis), which has the highest precision (narrower confidence intervals). Pooling outcomes across studies is challenging because they are measured using different scales. Pooling the results of each scale independently is undesirable because it does not allow all the available evidence to be included and can lead to imprecise estimates (only a few studies would be included in each analysis, leading to an overall small sample size and wide confidence intervals). As long as the different scales represent the same construct (eg, severity of anxiety), pooling outcomes across studies is needed. In this guide, we describe several approaches for meta-analyzing outcomes measured using multiple scales. The methods used can be applied before the meta-analysis (to individual study estimates that are then meta-analyzed), after the meta-analysis and generation of the SMD, or they can be based on individual trial summary statistics and established minimally important differences (MIDs) for all instruments.3 We present a simplified approach focused on the general concepts of the SMD, the ratio of means (ROM), the MID, and conversion to relative and absolute binary measures. For each approach, we describe the method used and the associated assumptions (fig 1). We apply these methods to a dataset of five randomized trials comparing SSRIs with placebo (table 1). These trials used different anxiety scales and one trial presented its results as a binary outcome. We use this dataset to show the common approaches described in this guide and how the clinical scenario was addressed by providing an interpretation (a narrative) to convey the results to end users such as clinicians and patients. Figure 1 shows two commonly used methods to derive the SMD: Cohen’s d and Hedges’ g. Hedges’ g includes a correction for small sample size.6 Small sample size can lead to biased overestimation of the SMD.4 The SMD method can be complemented by three additional approaches. 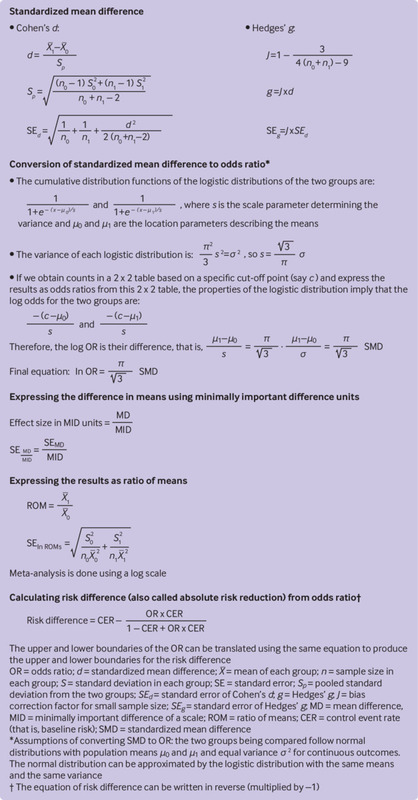 Continuous outcome measures such as the SMD can be converted to odds ratios. Although several approaches are available, the most commonly used method is to multiply the SMD by π/√3 (about 1.81) to produce the natural logarithm of the odds ratio.89 This conversion from the SMD to the odds ratio can be performed by some statistical software packages.4 The main advantage of this approach is the ability to combine studies that present the outcome in a binary fashion (that is, number of responders) with studies that present the results on a continuous scale. Figure 1 presents the assumptions and an explanation for this approach. Interpretation of this odds ratio is challenging. The Cochrane Handbook for Systematic Reviews of Interventions5 implies that the odds ratio refers to an improvement by some unspecified amount. Based on the characteristics of logistic distribution, which indicate that the calculated odds ratio is invariant to the cut-off point (fig 1), we propose that this odds ratio can be interpreted as follows: the ratio of the odds of patients with a measure higher than any specific cut-off point to those with a lower measure. Therefore, this odds ratio applies to any cut-off point of the continuous data. The cut-off point defining the magnitude of improvement on the various anxiety scales can be determined by practitioners to represent a meaningful change. Box 1 shows the SMD based methods applied to the example of anxiety in children. *All analyses use the DerSimonian-Laird random effect model (presuming that the assumptions of this model are met). For simplicity, the end-of-trial means in the two groups are compared (rather than comparing the change in means in the two groups). The MID is defined as “the smallest difference in score in the outcome of interest that informed patients or informed proxies perceive as important, either beneficial or harmful, and which would lead the patient or clinician to consider a change in the management.”10 Meta-analysts might consider expressing the outcomes of each study using MID units and then pooling the results (which now have the same unit, the MID) in the meta-analysis. Figure 1 shows the formula for this expression. Box 2 shows the MID based method applied to the example of anxiety in children. Another simple and potentially attractive way to present the results of continuous outcomes is as a ROM, also called a response ratio in ecological research.14 When the means of the first group are divided by the mean of the second group, the resulting percentage is theoretically unitless. This percentage is easy to understand and can be combined across studies that have used different outcome instruments. Pooling is done on the log scale.15Figure 1 shows the formula for this expression. The ROM can also be imputed directly from the pooled SMD by using the simple equation ln(ROM)=0.392×SMD. This equation was derived empirically from 232 meta-analyses by using linear regression between the two measures (however, the coefficient of determination of that model was only R2=0.62).16 The ROM is less frequently used in meta-analyses in medicine. Box 3 shows the ROM based method applied to the example of anxiety in children. *All analyses use the DerSimonian-Laird random effect model (presuming that the assumptions of this model are met). For simplicity, the end-of trial-means in the two groups are compared (rather than comparing the change in means in the two groups). Box 4 shows how the absolute effect is generated for the example of anxiety in children. Interpretation: in 100 patients with anxiety who do not receive treatment, 33 will improve. However, when 100 patients with anxiety receive SSRIs, 74 will improve (difference of 41 attributable to treatment with SSRIs). Continuous outcomes such as quality of life scores, arthritis activity, and severity of anxiety or depression are important to patients and critical for making treatment choices. Meta-analysis of these outcomes provides more precise estimates for decision making but is challenged when individual studies use multiple instruments with different scales and units. Several methods are available to deal with this issue and include using the SMD, back transformation of the SMD to natural units, converting the SMD to an odds ratio, using MID units, using the ROM, or converting continuous outcomes to absolute effects using a baseline risk appropriate for the target population. By using the MID, some of these statistical challenges may be reduced; however, the MID is not always known for many scales. When the SMD is converted to an odds ratio, empirical evaluation shows that at least four of five available methods have performed well and were consistent with each other (intraclass correlation coefficients were ≥0.90).17 Nevertheless, the assumptions of these methods vary and may not always be met. When the effect size is extreme, the conversion to an odds ratio may be poor. Some conversion methods can be considered exact methods using the normal distribution, which makes the resultant odds ratio dependent on the cut-off point17 and further complicates intuitive interpretation. Not all of the described methods have been implemented in the commonly used meta-analysis software packages and may require statistical coding. It is important to reiterate that for any of these methods to be valid, the scales or instruments being combined across studies need to have assessed the same or a similar construct. Contributors: All authors contributed to the design of the manuscript and interpretation of the data. MHM developed the first draft and ZW, HC, and LL critically revised the manuscript and approved the final version. The corresponding author attests that all listed authors meet authorship criteria and that no others meeting the criteria have been omitted. MHM is the guarantor. Funding: This research did not receive any specific grant from any funding agency in the public, commercial, or not-for-profit sector. HC is supported in part by the National Library of Medicine (R21 LM012197, R21 LM012744), and the National Institute of Diabetes and Digestive and Kidney Diseases (U01 DK106786). The content is solely the responsibility of the authors and does not necessarily represent the official views of the National Institutes of Health.
. Introduction to Meta-analysis.John Wiley and Sons, 2009doi:10.1002/9780470743386.
. Cochrane Handbook for Systematic Reviews of Interventions.Wiley-Blackwell, 2008doi:10.1002/9780470712184.
. Statistical Methods for Meta-Analysis.Academic Press, 1985.
. Statistical Power Analysis for the Behavioral Sciences.2nd ed. Lawrence Erlbaum Associates, 1988.
. The meta-analysis of response ratio in experimental ecology. Ecology1999;80:1150-6doi:10.1890/0012-9658(1999)080[1150:TMAORR]2.0.CO;2.